In my opinion Todd Cruse is no better than Senator Ford. I've been trying to tell my readers for months that FORBA, Todd Cruse, Michael DeRose, Doral Dental and the whole bunch associated with FORBA are crooks! I'm looking forward to other senators to get nailed from doing dirty business with FORBA in the near future. How many children did Small Smiles/FORBA and Doral Dental, who manages the management of FORBA, abuse to give Senator Ford his 1.7 million dollar cut. Let's see, at $220 per baby root canal that's close to 8,000 teeth just for one senator's payoff. As you can clearly see, FORBA/Small Smiles just can't seem to keep their asses out of the spot light now can they? Former state Sen. John Ford and his business partners were paid roughly $1.7 million in consulting fees from a TennCare contractor, according to a key government witness who testified in federal court on Monday. Ford, 66, is accused of receiving consulting fees from two TennCare contractors, Memphis-based OmniCare and Wisconsin-based Doral Dental, from 2002 to 2005 while he served as a state senator on the general welfare committee and the TennCare oversight committee. Ronald Dobbins, a Pennsylvania businessman who was one of Ford's partners in the consulting firm Managed Care Services Group, testified that the Memphis Democrat received 40 percent of the consulting fees from Doral Dental and the other partners got 30 percent. Dobbins initially worked for United American Health Care, the parent company of OmniCare. 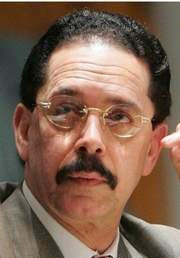 He testified that after leaving the company he created the consulting firm, Managed Care Services Group, in 2001. He said the initial consulting partnership was between Ford and him. Then he found out that Ford had invited Osbie Howard, the chief executive officer of OmniCare, to join them. Howard handled the money, Dobbins told the jury. Dobbins testified that he collected around $300,000 from Doral Dental over three years for doing little to no work. Dobbins testified he had no knowledge of what Ford was doing on Doral's behalf. Todd Cruse, a lobbyist for Forba, which operates dental centers for low-income children, was trying to get work through TennCare in Tennessee through Doral. Cruse sought out legislators in the districts where the dental centers were being opened, he testified. He sought out members of the black caucus, including Ford. Cruse testified that after a dinner at a PF Chang's in Memphis, he approached Ford about Forba having a shot to work in the state. "He chuckled," Cruse said. "And he said, 'They call me Mr. 15 percent.' When a legislator says he's known as Mr. 15 percent, it sorta sticks with you." In cross-examination, federal public defender Isaiah Gant attacked Cruse for not reporting the 15 percent comment to anyone. Gant also noted that Dobbins was initially the subject of the investigation into wire fraud. Dobbins received immunity in exchange for his testimony and cooperation with the government. Ford is charged with two counts of wire fraud and four counts of making false statements on official documents. The wire fraud charges carry a maximum penalty of 20 years. The maximum sentence for each of the four other charges is five years. Dr. Kenneth Knott: Owner or Front Man?